AJJA est un artiste éclectique aux multiples talents, qui canalise sa créativité à travers des carrières parallèles de musicien/producteur/dj, manager du label Peak Records, graphiste et artiste de tatouage. Né à Londres en 1975, il grandit sur la route avec sa célèbre famille d’artistes de tatouage et voyageurs. En voyageant dans le monde et en fréquentant des scènes artistiques variées, il est exposé à une force créatrice constante et commence à jouer de la guitare et à composer de la musique dès son enfance. Bien qu’élevé dans une ambiance rock’n’roll et funk, Ajja se tourne graduellement vers la musique électronique vers la fin des années ’90, ce qui le pousse à explorer de nouveaux horizons numériques. Ajja est un membre fondateur du label suisse «Peak Records» ainsi que du très apprécié «The Peaking Goddess Collective», un groupe de chill & psytrance qui fusionne instruments live et machines électroniques. Il est aussi la moitié du projet «Yab Yum», un renommé duo de psytrance nocturne. En 2005, Ajja commence son projet solo qui lui apporte vite une reconnaissance internationale. Ses performances live très appréciées, où il fusionne son expérience psychédélique et l’amour des rythmes funky, ont fait d’Ajja un habitué des plus importants festivals et parties de la scène psy mondiale. Son premier album «Psychogenica» sort en novembre 2007 sur Syncronize Records et est reçu avec beaucoup d’enthousiasme. Après quelques années de concerts et travail en studio intensifs, son très attendu nouvel album «Tulpa» sort en février 2012 sur Peak Records. Pas satisfait avec tant d’activité, Ajja compose également de la musique pour le théâtre, s’occupe du graphisme des albums de Peak Records avec sa compagne Tanina Munchkina, crée des applications web et travaille comme artiste de tatouage dans le studio de famille en Suisse. Energique, enthousiaste et surdoué, Ajja est un artiste à ne pas manquer! AJJA is an eclectic and multi-talented Swiss artist who channels his creativity through parallel careers as musician/producer/dj, Peak Records label manager, graphic artist and tattoo artist. Born in London in 1975, AJJA grew up roaming the planet with his world-renowned family of tattoo-artists and travellers. Wandering across the world and bathed in various artistic scenes, he was provided with a constant creative drive. He started playing guitar when he was nine years old, and having been reared in a rock’n’roll and funk atmosphere, he first concentrated on these musical styles. By his mid-teens, he had composed, produced and recorded over one hundred original songs. He performed with a number of live bands in different countries and continued to create music and release rock albums for another decade. During this time, he also picked up the family trade and started tattooing alongside his parents and older brother Filip Leu. At the end of the nineties, his interest gradually shifted towards electronic music, causing him to explore new digital horizons. In 2002, AJJA and musician friends Master Margherita, Dymons and Flooting Grooves created The Peaking Goddess Collective, a chill & psytrance band that fuses live instruments and digital technology. After performing in many parties and festivals and releasing tracks on many compilations, their debut album “Organika” was released on Peak Records in August 2007. In the summer of 2003, AJJA, in collaboration with his partner, visual artist Tanina Munchkina and musicians Dj Gaspard and Master Margherita, founded the psychedelic trance label Peak Records. In five years, the label has gained respect and a solid reputation in the psytrance scene, releasing many quality night-time and chill albums and compilations. The same year saw the birth of Yab Yum, the fully digital project shared by AJJA and Dj Gaspard. 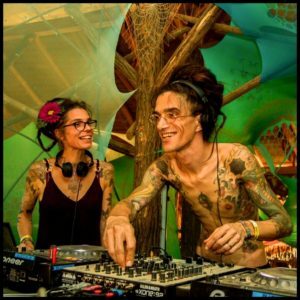 They have since released numerous tracks on world-renowned labels, and their debut album “Nocturnal Emissions”, released on Peak Records in December 2006, has been widely praised in the international psytrance scene. They have performed with growing success worldwide from Japan to South America. After Dj Gaspard, left Yab Yum in June 2008, Ajja decided to continue the project by himself. In 2005, AJJA started a solo project under his own name. This digital live-act is primarily 144bpm-based, focusing on groovy, non-cheesy, psychedelic trance that can be played in the morning or in the middle of the night. AJJA released his first solo night-time track in 2007, followed later the same year by his debut album “PSYCHOGENICA”, on the Irish label Syncronize Records. In 2008, AJJA had more releases on Peak Records, the Boom 2006 dvd, Syncronize, Northern Psylights, Gaian Mind, Phar Psyde, Liquid, Pixan with more new tracks to come. His second album is in the works and is planned for release on Peak Records in late 2009. In the past three years, AJJA has performed in numerous parties and festivals including Boom, Universo Paralello, Full Moon, Antaris, Glade, Soulclipse, Life, Gaian Mind, Wickerman, World People, Forgotten Ritual and Waveform Project. His much appreciated live sets have already rocked & grooved dancefloors in Japan, The United States, Canada, Brazil, Russia, Switzerland, France, Portugal, Germany, Austria, Italy, England, Ireland, Scotland, Ukraine and Turkey. Not satisfied with so much activity, Ajja also composes music for theater plays, designs Peak Records covers with his partner Tanina Munchkina, designs web applications and works as a tattoo artist in his family’s shop in Lausanne, Switzerland. An energetic, enthusiastic and gifted being, AJJA is an artist not to be missed!